WLP’s efforts to improve the Learning Center’s searchability and to increase its content are ongoing. Here are some helpful tips to help you get the most out of the Learning Center. There are two ways to search WLP’s Learning Center and website. The first is the search box at the top of the webpage; the second is the search filters in the Learning Center. The search box is the easiest way to find content if you already know what topic or person you wish to research. Identify the search box. The search box is indicated by the symbol of a magnifying glass at the very top of the webpage. Click on the magnifying glass to bring up the search box. 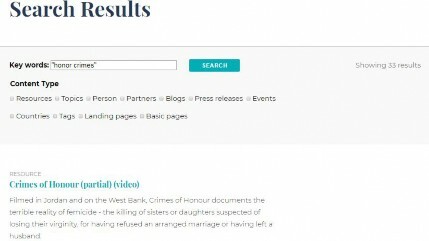 Type your search term into the search box, for example “honor crimes” or “Mary Robinson.” When searching for a topic or person that is more than one word, narrow your results by putting the issue or name in quotation marks. Refine your search further from the search results page. Tick the boxes to filter by content type. You will be presented with the following options: Resources (items in our Learning Center), Topics, Person, Partners, Blogs, Press releases, Events, Countries, Tags, Landing pages, and Basic pages. Refine your search by type of content and click on the SEARCH button to refresh the search. The most frequently used content types are Resources, Topics, Person, Blogs, and Events. The Learning Center filters are helpful in browsing the content available relating to WLP’s programs, campaigns, and publications. The filters can narrow your search by topic or country if you do not have a specific person, issue, or event in mind. Identify the white LEARNING CENTER button in the top right-hand corner of the homepage. Click on the LEARNING CENTER button; you will be redirected to the “Browse the Learning Center” page. Use the All Resource Collections filter and choose Interviews with Women Leaders to get a list of recorded interviews. Narrow your search using the filters, then click the APPLY button to refresh the search. For some searches, you can refine your search further. The words will appear below the search filters. Note: If you click on and choose additional filters, you will need to click on APPLY one more time. 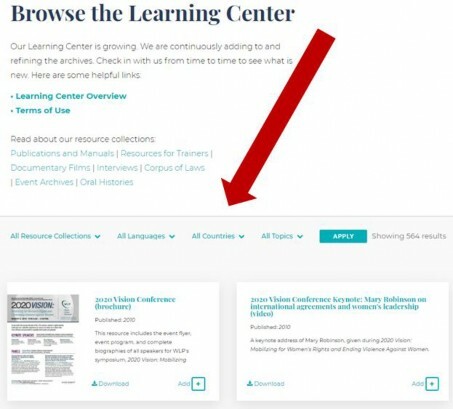 The Learning Center filters are helpful in identifying books, manuals, excerpts from manuals, videos, and other content for facilitating training workshops. Click on the LEARNING CENTER button in the top right-hand corner of the homepage, you will be redirected to the “Browse the Learning Center” page. Scroll down that page until you reach the filters. The filters are All Resource Collections, All Languages, All Countries, and All Topics. Choose Resources for Trainers in the All Resource Collections dropdown filter. Click the APPLY button to bring up a list with links to over 100 manuals, excerpts from manuals, and multimedia tools for trainers. To refine your search, click the button located below the search filters. Note: If you click on and choose additional filters, you will need to click on APPLY again to refresh your search. To identify documentaries for your workshop, select Documentary Films in the All Resource Collections dropdown filter and click on the APPLY button. To identify videotaped interviews with leading women’s rights advocates for your workshop, you can select Interviews with Women Leaders in the All Resource Collections dropdown filter and click on the APPLY button. To review legislation related to your topic, you can select Corpus of Laws in the All Resource Collections dropdown filter and click on the APPLY button. Your search can be further refined by selecting from the All Languages, All Countries, and All Topics dropdown filters, and clicking on the APPLY button. 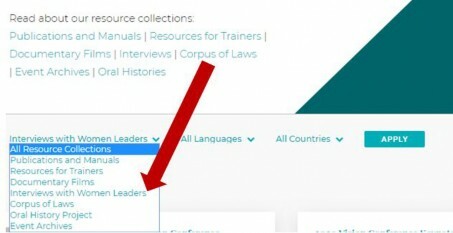 The Learning Center filters are helpful in identifying constitutions, penal codes, and civil laws in our archive that relate to specific women’s rights topics, are from a specific country, or are in a specific language. Scroll down until you reach the filters. The filters are All Resource Collections, All Languages, All Countries, and All Topics. Select the Corpus of Laws in the All Resource Collections dropdown filter to review legislation in WLP’s law archive. Narrow your search by country using the All Countries filter, by language, by using the All Languages filter, and by topic, using the All Topics filter and then clicking APPLY. To refine your search further, click on the button below the search filters and click APPLY again to refresh the search. Note: If you click on and choose additional filters, you will need to click on APPLY again to refresh your search. The Learning Center filters are helpful in identifying documentaries on women’s rights and video recordings of interviews with leading women’s right advocates. Select Documentary Films in the All Resource Collections dropdown filter. Select Interviews with Women Leaders in the All Resource Collections dropdown filter to review our archives of recorded interviews with leading women’s rights advocates. Similarly, you can further narrow your search by using the available filters. Be sure to click on the APPLY button again after you have set the filters to refresh your search.